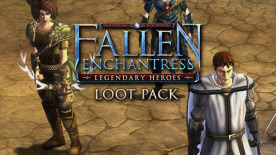 New treasure is available to be found in this third DLC for Fallen Enchantress: Legendary Heroes. Explore abandoned graveyards and you may find a Cursed Bell which can be rung at desperate moments in battle. Treasure chests may contain a Staff of the Serpent or a piece of Blood God armor. Design your custom sovereign with a Revenging Ring, Bunny Slippers and other new items. Enchanted with the power of a Skath, it enables the Deadly Bite ability. Enchanted with the speed of the stag, allowing the wielder to fire early and often. A nobleman’s bow which grants additional experience to its wielder. This shortbow webs victims that are shot by it. This petrified form of a serpent shoots poison and can summon a Naja in battle. A blessed staff with low attack but it can heal surrounding allies. Magical staff that fires shadowbolts that damage and reduce the spell resistance of the target. A massive lollipop with the Bash and Sugar Rush special abilities. A longsword that crits with every attack. Cursed axe that strikes a random ally or enemy in range. Dagger that silences anyone who is hit for 3 actions. Though they don’t provide any defense, but they do grant +10 Dodge and +20 Dodge when defending. Plus they are really comfy. This plate helm makes the wearer Immune to Swarm. Accessory that grants +5 accuracy, dodge and spell resistance. Armored boot that grants +25 Defense when defending. Plate cuirass that makes the wearer 30% immune to physical damage. Armored greaves that make the wearer 20% immune to physical damage. Bladed gauntlets that double the damage done with critical hits. Negates all damage to the wearer from Blood God armor. Cursed breastplate that enables the Anguish ability that does 8 damage to all surrounding units (allies and enemies) and half that to the wearer. Cursed greaves that do 2 damage to anyone striking the wearer and 1 damage to the wearer. Cursed vambraces that do 2 damage each time the wearer strikes an enemy and 1 damage to the wearer. Cursed boots that double all damage (to the wearer and enemies) done by Blood God armor. Each time the wearer is struck the ring gains a charge. Release those charges to damage an opponent equal to the amount of stored charges. Each time the wearer is struck the ring gets a charge. Release those charges to heal the user equal to the amount of stored charges. Throw these teeth onto the ground to summon 3 skeletons in battle. When rung all units (allies and enemies) must resist or lose their next action. Using the scroll allows all of your allies to take an additional action in battle. Potion that gives the imbiber 3 actions. Uncorking this potion knocks the wielder and all adjacent units prone. Use the scroll to trap a unit in battle for 5 actions, and they take damage on each action. Use the scroll to keep a unit from being able to cast for 3 turns.